In the wrong hands, hair extensions can be damaging. It requires proper application and education to the client on how to care for them. A stylist who has undergone training should know how to select the right kind of your hair type and goals, and how to apply and remove them without damaging your hair. I personally believe properly applied extensions are no more damaging than bleach and highlights. In fact, many clients get them to add highlights to their hair instead of bleach. In our salon, we do extensions as often for thickening and to enhance hair color as we do them for length. Many women love the added texture and fullness they get with extensions! Their hair will hold curl longer and actually make getting ready easier and more enjoyable. Even with shorter hair, Savvy can’t live without her Hotheads extensions for the fullness and style they put into her hair! You have to be committed to taking proper care of them, and investing in quality products to ensure they stay healthy. Yes, they take longer to blowdry and there is more hair to style. However, they hold curl really well and your style lasts longer! Also, the added hair absorbs more oils from your scalp and will extend the days between washes. For me personally, I spend less time daily on my hair when I am wearing extensions. Now, the days I wash are more time consuming, but it’s worth it. The great news is there are several options out there for every budget and lifestyle. We have many people come in for a consultation expecting to pay more, and we have some who leave with sticker shock. Always go for real “remy” human hair. Remy means the hair strands are all assembled with the cuticle going in a downward direction like your own hair. The best ethnicity is Indian hair because it’s a more natural texture that works well with all hair types. Quality hair is costly and this will reflect in the price. Also, the training and certification for the stylist is a large financial investment they have to recoup, not to mention the time it takes to properly apply and blend the hair. Bottom line, don’t ever get extensions on a deal. This is a perfect example of you get what you pay for. The color matching, cutting, and blending will make or break your look. 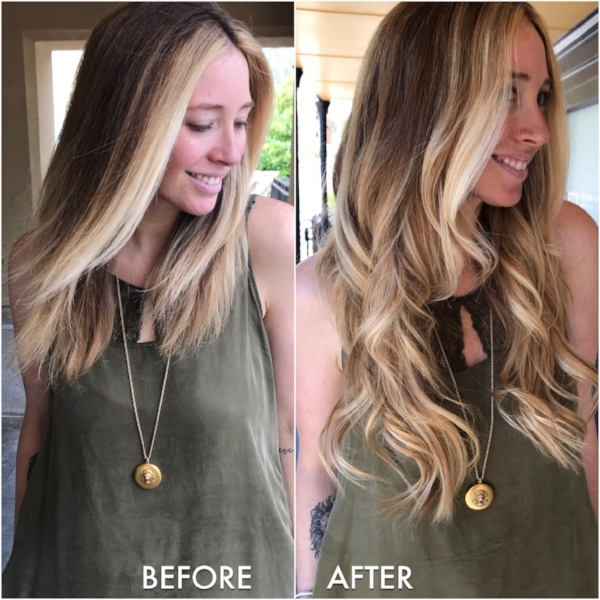 For your hair extensions to look natural, there are considerations like using a variety of colors and putting in enough hair to allow for layers and blending into your own. Don’t skimp on amount of hair. If your stylist recommends a certain amount that is above your budget, hold off and keep saving. Don’t compromise by just getting less hair. It will show. You should be able to wear your extensions straight or curled! We have clients that range from college students to young professionals to busy mommas. Some clients save up to invest in this service one time for a special season and some build it into their budget and wear them year-round. At Crown, we offer a variety of brands and types of hair extensions. SHE by Socap individual keratin bonds AKA hot fusion and strand by strand application. Socap is a 40 year old leading brand when it comes to hair extension quality with a wide range of colors and textures. These are ideal for all hair types, but especially for finer hair types because they can be cut in half for smaller bonds to apply to your fine hair. ExtenClip by SHE by Socap is a 9 piece 100% natural hair clip-in system. We color match your natural hair and custom order your clip-ins, then show you how to put them in and blend them to your own hair. Prices range from $300-$400 depending on length. HotHeads tape-in extensions use medical grade adhesive tabs of hair to add fullness, length and color. No heat needed, and the hair can be re-tabbed up to 3 times for extensive wear time with proper care. Ideal for all hair types. The Band by HotHeads is a one-size fits all hair accessory you can apply yourself any time you want to add fullness, length and color to your hair. Unlike other wefts, there are no clips or hooks making it extremely comfortable to wear and easy to put in.